It's often said that Science Fiction is the literature of change. When a culture is undergoing a lot of changes due to scientific advances and technological developments, and expects to undergo more, it's hardly surprising if stories about these changes become popular as a way of expressing people's feelings (optimistic or otherwise) about change. Note that the changes may be in our ability to control the world, or just in our understanding of it. For example, some "post-holocaust" stories, such as Wyndham's The Chrysalids (also known as Rebirth ), portray cultures that understand and control less of the world than we do; the scientific element consists of our understanding of their world, and of how it arose out of our world. Other stories offer future technologies that we can hope for based on present-day science, but haven't developed yet, such as fusion-powered spaceships. Yet others go beyond this to dazzle us with future science that differs from what is now believed, but they retain some recognisable elements of the world we live in, so we can at least believe that the world depicted in the story might some day come to be. This leads up to my loose definition of ScF as fiction set in a world that differs from our everyday world in a way that importantly involves science or technology. Some people add that ScF should make you think about possible future worlds and alternatives thereto, but I'm quite glad to have some fiction that's purely entertainment. If history is any guide, there will always be plenty of ScF that asks questions (and usually supplies ready-made answers) about changes in the world and the futures to which they may lead. A science fiction story must be set against a society significantly diferent from our own -- usually, but not necessarily, bcause of some change in the level of science and technology -- or it is not a science fiction story. ... the science fiction story destroys our own comfortable society. 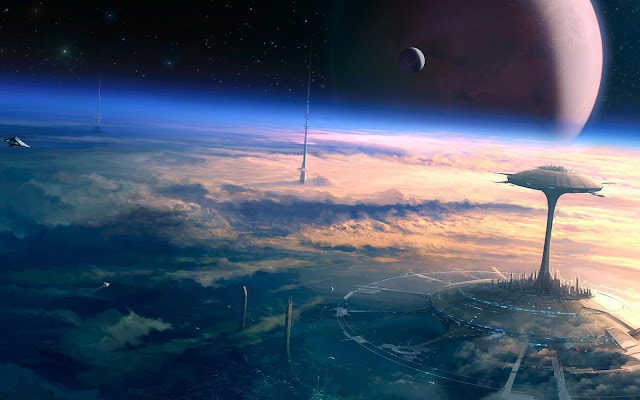 The science fiction story does not deal with the restoration of order, but with change and, ideally, with continuing change ... we leave our society and never return to it. Another widely-held view is that ScF is fiction that describes the impact of science or technology on people. To the extent that its readers are "science buffs" (never mind whether they know any science! ), this may well be the chief reason they enjoy reading it. Its heroes are often those who understand the science or technology, which can add an element of wish-fulfillment. It can also contribute to the ghastly stereotype of the ScF reader as someone with no accomplishment or merit other other than science, and no interest in the impact of art on people, or for that matter of people on people. For my opinion of this definition, see below. I like this one, though it has to be read carefully. It's also rather flexible, depending on what you regard as a scientific influence on your view of the world; which is probably a point in its favour. It is strongly rumoured that Heinlein wrote his "juvenile" novels partly with the intention of inspiring his young readers to take an interest in science and technology. I also rather enjoyed this page where David DeGraff describes his success in using short ScF stories to help teach introductory astronomy. Aside: the "sf" in rec.arts.sf.written stands for Speculative Fiction, covering (at least) science fiction, fantasy, and alternative history. Damon Knight and Tom Shippey offer interesting observations about how ScF relates to fiction in general and to "pastoral" fiction. There is a centuries-old tradition whereby authors who have something really pungent to say about the society in which they are living will present their criticism as a work of fiction, ostensibly about another society living in a remote place to which the protagonist is somehow transported. Is this kind of thing science fiction? When I was too young to see through the veil of fiction to the kernel of satire, I used to read it eagerly. Certainly most of it is about worlds that differ from ours, but only to the extent necessary to make the author's point, and sometimes by a simple reversal: in Erewhon , Butler depicts people being punished if they have a cold or a fever, and attended by a doctor if they defraud someone. These days I find it hard to see much of either science or fiction in such works, though I find them much funnier than I did as a child. OTOH there's a fine line between satire disguised as ScF and fiction which tries to show how society could change radically if the rest of the world changed just a little (a playful example is Edmund Cooper's Five to Twelve ). By my definition above, the latter is genuine ScF. People have argued whether books like Clancy's The Hunt for Red October are ScF. Undeniably they describe the impact of technologies on people, and the technologies are not the ones found in my everyday world. OTOH these technologies do exist now, and are part of the everyday worlds of people like the characters in the books (e.g. military personnel). Thus they fall outside my definition of ScF but within some others. I feel safe in claiming that they are not much more speculative than the average detective story. And after all, there are a fair number of Westerns that describe the impact of steam train technology on people who used to ride horses; does this make them into science fiction? Neyir Cenk Gokce has compiled an excellent list of short definitions of ScF given by authors (and by some people whose names I don't recognise). I rather like the one by Pohl. I've put a few longer definitions that I found interesting onto a sub-page. Another such list can be found at Magic Dragon, who also has a link back to this site, so it seems only fair that I should link to his. Here's something which I used to attribute to Heinlein. I couldn't find it in his essay RayGuns and Rocket Ships (collected in Expanded Universe ), though. I'm indebted to Peter Knutsen for pointing out that it appears in Bova's Challenges in an article entitled Science in Science Fiction . It's this: a work shouldn't count as ScF unless the science is necessary to it. This takes aim at the many stories where, if you replaced the spaceships with covered wagons, the green skins with red ones, and the lasers with six-shooters, nobody could distinguish the resulting epic from a (usually rather poorly-written) Western. Indeed, I like to call such stories "Mars Westerns". They are just adventure stories (or romance novels, or ...) with high-tech props, resembling science fiction the way Hamlet resembles a history of Denmark. Given their resemblance to the subset of "historical fiction" that is just present-day fiction in an exotic setting, perhaps they could be called "future fiction"; I've also heard "space fantasy" and "space opera" used to refer to something similar. They have one thing in common with Gulliver's Travels : they are not really about a world that differs from the one we live in.